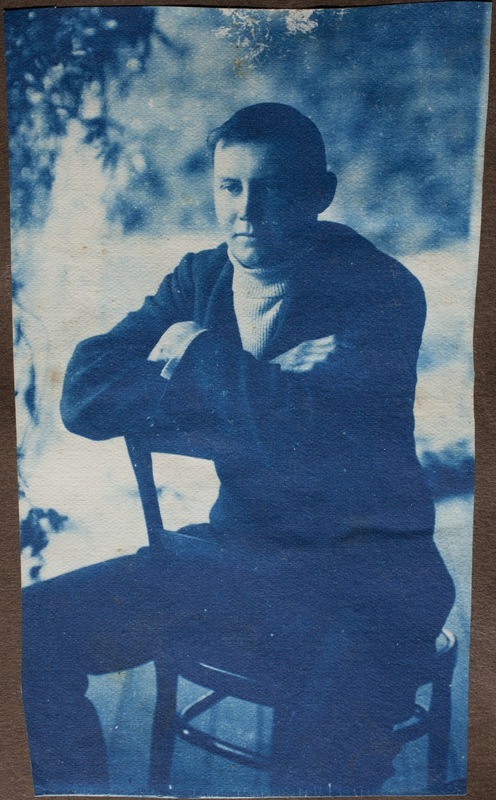 Douglas Day was living in community at the Richmond Mission, a fundamentalist Christian sect and working as a self-employed farm labourer when he was called up for military service in 1917. If our correspondent chooses to throw in his lot with a sect which interprets Scripture in such a way as to absolve him from the duty of striking a blow for freedom and civilisation, he deserves no sympathy whatever. Brave and gallant fellows are giving their lives by the thousand to protect snuffling “conscientious objectors” from the fate of the inhabitants of northern France and Belgium, and any man who would rather be enslaved by the Huns than lift his little finger in resistance to them is unfit to be a citizen of a free country. Douglas Day's appeal was dismissed, as was that of John Stubberfield, a cycle-maker and member of the Richmond Mission who appeared on the same day. Stubberfield stated during the hearing that five members of the Richmond Mission were already in goal. The magistrate’s response was, ‘that he had no doubt they richly deserved it, for allowing others to work and fight for them’. After Day failed to proceed to camp when ordered to do so on 1 July 1918, a warrant for his arrest was issued, and he was court martialled at Featherston Military Camp on 26 July 1918. His sentence was for one year and 11 months of hard labour for ‘disobeying a lawful command given by his superior officer’. Letters that Douglas Day wrote to his family while he was in prison show that his religious belief was an important consolation to him and he always presented a determinedly cheerful point of view. A letter he wrote from Featherston while he was waiting to be court-martialled said the military people were being very good to him; he had been put in a hut with a coke fire under a promise that he would not break camp, and was allowed to go anywhere within bounds. A later letter, probably also written at Featherston, said he had another young fellow from Woodville in the same hut, who held the same opinions, so they could talk to each other and read without interruption. You see I am still on my way to Paparua, but as this is my third week I hardly think it can last much longer, but of course one never knows in these institutions what a day may bring forth. I have not been well for a week or so. Had an attack of influenza and it left me with a slight turn of dysentery, but feel pretty well today so you need have no worries. Otherwise I am well altho I miss the fellowship of the others who were with me in the “Terrace”. Here I am alone so far as Christian fellowship is concerned but “He abideth faithful and in Him I have perfect peace”. At Paparua he was pleased to find himself once more amongst his friends from the Richmond Mission and other men he knew. 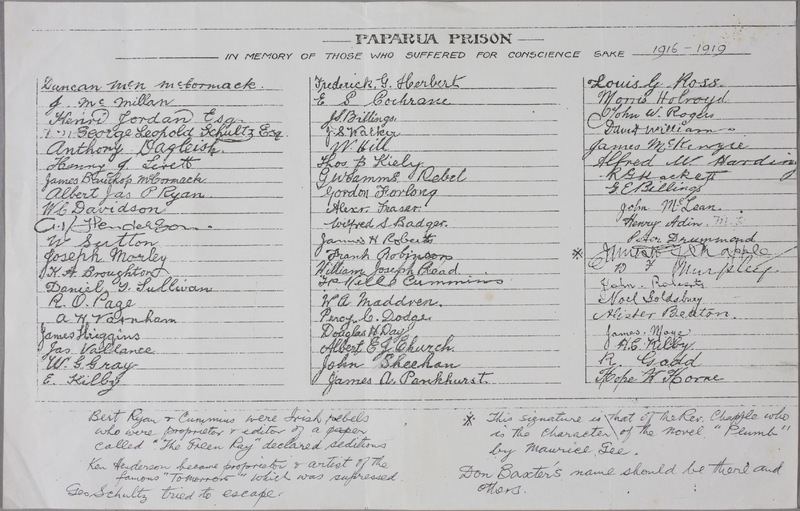 Paparua was nicer than a town jail and he was ‘perfectly satisfied and content’ though they received less news of the war than in the other jails. By December a number of the CO's were ill with influenza and Day helped to nurse them. Consequently he had more liberty though he was not allowed visitors because of the epidemic. It was also difficult for his family who did not own a car to get to Paparua. They had to try and get a seat in a car with some other visitor. At Christmas 1918 Douglas Day was delighted to receive letters and sweet peas from his family  and a food box which Sarah Page had organised, one for each of the 60 conscientious objectors. Each box contained two pieces of cream sponge, sundry pieces of fruit cake, shortbread and mince pies, two apples, a few cherries, a small bag of sweets, muscatels and a piece of chocolate. Founded in 1911 by Florence Smith and her husband David, the Richmond Mission was known for its evangelical and charitable work. A fundamentalist sect, its members believed the Bible to be literally true. At its peak the Mission had 250-300 members. Several members of the Mission served prison sentences during the war and in July 1917 David Smith on behalf of the Richmond Mission asked the Military Board to re-hear the appeals of two members, arguing that the Mission was a religious body within the meaning of the act. The re-hearing was refused. Douglas Day was released from Paparua Prison in August 1919 and continued to live a quiet life in community with the Richmond Mission. 'Richmond Mission', Sun, 14 June 1918, p.4. Paul Baker, King and Country Call: New Zealanders, Conscription and the Great War, (Auckland: Auckland University Press, 1988), p.111. 'The Conscientious Objector', Thames Star, 18 June 1918, p.2. Ruth Day to her daughter Muriel Lovell-Smith, 29 July 1918, Margaret Lovell-Smith personal collection. Ruth Day to her daughter Muriel Lovell-Smith, [4 August] 1918, 11 August 1918, Margaret Lovell-Smith personal collection. Douglas to his mother Ruth Day, written from H.M. Prison Lyttelton, 13 October, 1918, Margaret Lovell-Smith personal collection. Douglas Day to his mother Ruth Day, written from H.M. Prison Templeton n.d., Margaret Lovell-Smith personal collection. Ruth Day to her daughter Muriel Lovell-Smith, 6 October 1918; 16 October 1918, 8 December 1918, Margaret Lovell-Smith personal collection. Ruth Day to her daughters Muriel Lovell-Smith and Margery Day, 31 December 1918, Margaret Lovell-Smith personal collection. Douglas Day to his mother Ruth Day, written from H.M. Prison Templeton, 20 December, 1918, Margaret Lovell-Smith personal collection. 'Military Service: Exemptions Sought: Christchurch District Appeals', Sun, 14 July 1917, p.10.